There are many bead crafts ideas today that you will never run out of beading ideas. 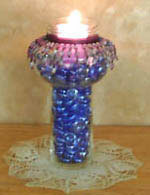 Besides making jewelry you can make beaded bookmarks, bead candle holders and even beaded towel holders. There are so many different ways to use beads besides just jewelry. You can make bookmarks, room dividers, lamp shades and many other things. Just let your imagination go and you will come up with many new and different ideas for beadwork. I have been doing bead crafts for many years. I started by making my own jewelry and then that bloomed into my own jewelry business. I will show you how to make your own necklaces, bracelets and earrings. I never use to wear anklets until I seen the beautiful ones you can make yourself. Can you imagine the pleasure you will get when you give that friend or family member a beautiful piece of jewelry that you created just for them! After you have gained a little bit of experience you can even start selling your jewelry. There are people who love to buy handmade peices created just for them. There are so many unique and beautiful beads on the market now that the sky is the limit. I found that this place offers a huge selection of exceptional beads at low prices. Plus, they even offer free shipping . Just take your time and your creativity will show through your own bead crafts. Beading is so much fun and you can come up with many different ideas. Have fun making your own jewelry crafts!! Check back often as I will be adding a lot more. Learn how to make beaded earrings. You can learn how to make beaded earrings the simple way. To make a beaded bracelet follow these instructions. You will find all the beaded bookmark information you need here. Make your own beaded candle holders with this simple process. Make some beaded towel holders to impress your guests. Make your own beaded artifical fruit with seed beads. Learn how to make wire sculpture jewelry in your own home. - Answers to fused glass related questions. Instructions are clear for beginners. The technical terms are explained. Learn how to sell your jewelry in your own home town.